Any questions comments or concerns can be posted here. Just a couple of things I've noticed, Fox; you need to try and do something with the grass so it doesn't look so tiled, (My usual trick is just to reduce it to 1/4 size and then flip them all so that a common corner is in the middle). The other thing is that you need to make the background the same colour as the fog--in my experience, the background extends down and up from the skybox image in the colour of the adjoining pixel; in other words, make sure that at the least the top and the bottom line of your images are the same colour as the top background and fog respectively. Also, I'm finished with your comm pictures, I had to remove a frame since the brawl ones have 3 and LW has only 2 but anyway... any idea how I'm going to send them to you? 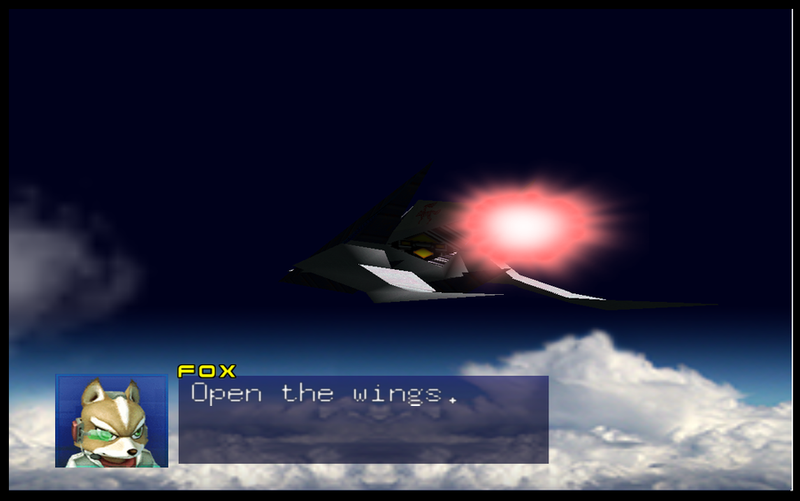 By the way, I've done some replacements for some of the sky boxes too if you're interested, and a version of Venom with atmosphere to go in the background of Area 6/Bolse, and trust me, you do not want to have to do that again... And do you have any more tasks? I'm still happy to oblige. Just a couple of things I've noticed, Fox; you need to try and do something with the grass so it doesn't look so tiled, (My usual trick is just to reduce it to 1/4 size and then flip them all so that a common corner is in the middle). Yeah, now that you said it that does look kinda weird. 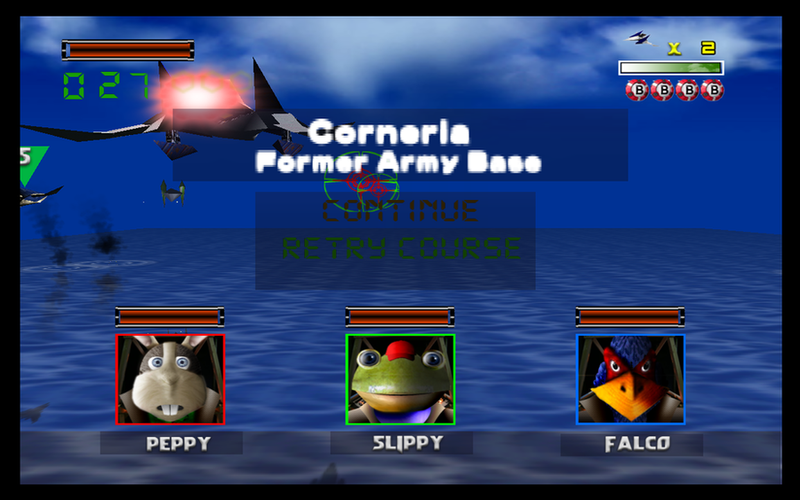 Peppy looks like he's stoned, Slippy looks... actualy sane, and Falco looks inanimate. The new menu looks great too. Keep goin' man! The grass tileage looks really irritating, take Andross's advice. The menu looks okay, but I would of kept the original font just make it more sharp. The sound button looks a little of as well. The characters scare me shitless. Falco looks like he has fur instead of feathers. The in-game stats look absolutely awesome. 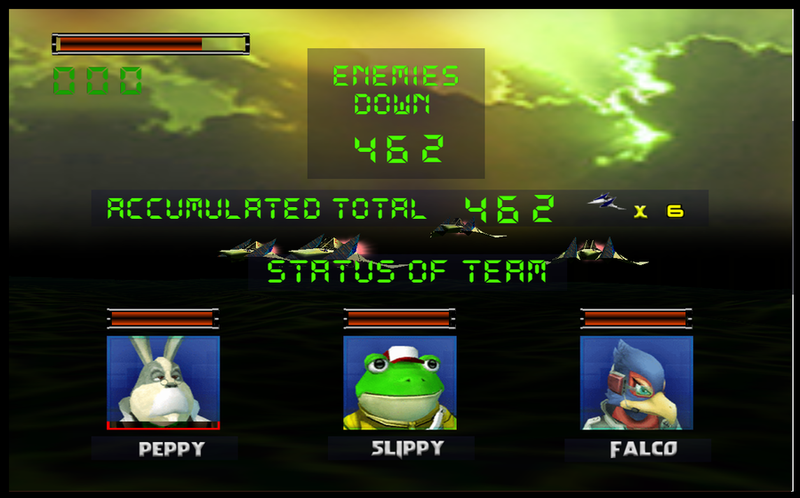 edit: wait, screenshot one and two have different designs for the health bar and score. I prefer the top one if that's the final product. 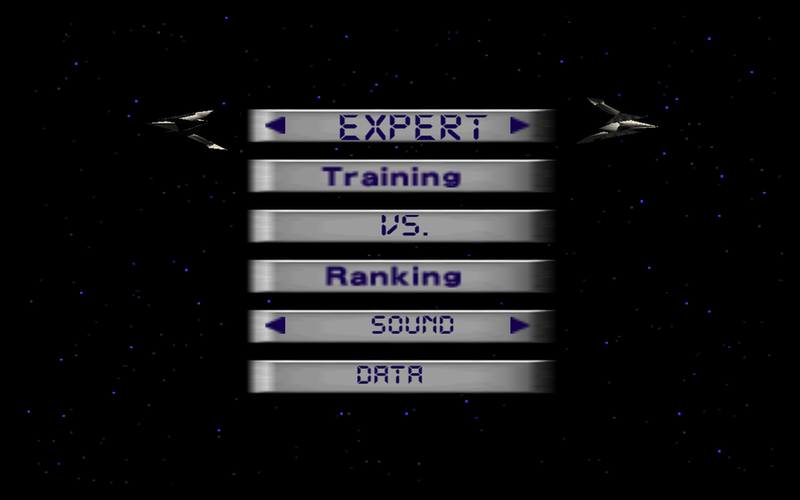 Everybody who's worried about the character's com portraits can relax; I've been working on transferring the brawl versions into ones compatible with Lylat Wars, so don't worry... I've just got to work out how to send them back. Andross, if you need tga's of the characters let me know. Also png or whatever format. If you need them, of course. Ok let me say one thing. there is only ONE textrure for the grass tile and it's extremely irritating to even attempt to fix it. making it smaller will just result in the same size that the original textures were. and to be honest the sky box seems to look fine to me. And thanks a lot andross. do you think you could put them in a .zip folder and upload them to a filesharing website? that would be much appreciated. i'd also like to take you up on your venom skybox offer. @ Marek. the health bar in the top picture is the one done by the unaided coder. the one on the bottom is done by me (the black and orange one) i know that the upgrades might not look like the originals, but that's not entirely what i'm going for. as this is my hack, i'm doing what i think might look good. i'm open to suggestions, but the health bar that i made took forever to get balanced. @ everyone else. about the centering of the menu. the one shot that i put there was a test to see if the textures i ripped would work in game. they did, so now i'm working on fixing them up. All of this things look sweet so far. You're going to remake all the game? I think I might start doing this. I just upgraded my xp pc to 2 gigs of ram, I should be set. I've added the Venom backgrounds too, (Both the in game one and the credits sequence one.) and a couple of skyboxes as well that you may or may not be interested in. Let me no if you have any problems. Oh, and BTW, the comm portraits look a little blurry due to the fact that I had to scale them up from the brawl pics... but I'll be happy to redo them if anyone can find bigger ones. I thought that I'd put them in the pack that I sent you, where they not there? Do you need me to resend them? Edit: @ Andross. HOLY CRAP THOSE TEXTURES ARE AMAZING! Not the ONLY one qualified! I have a couple more tasks for you seeing as you're really good at this kind of thing. If i send the textures for Fox with his glasses on, do you think you could edit the existing brawl textures to have fox with his dad's glasses on? 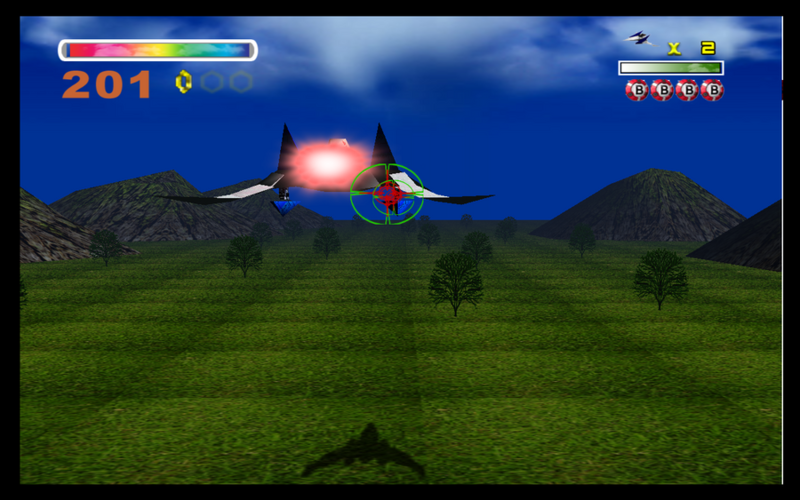 as well, i fail at finding a good engine texture for the arwing. @ any general readers in this thread. I have a huge favor to ask of any of you. If you have a good quality screen recorder like fraps, that WILL record bigger sized videos, i would appreciate if someone could download my texture pack (i will upload it temporarily for the volunteer) And record themselves playing a little bit of each level. it will help me a lot because i really need a new trailer out there rather than pictures.